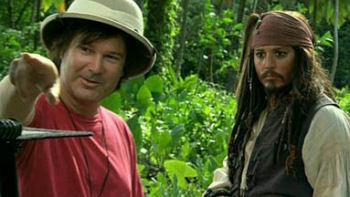 HOLLYWOOD—Johnny Depp is having the last "Arrrr!" on people who said a pirate movie wouldn't sail. The accidental superstar and his crew of stout-hearted men and women are here for the launch of Pirates of the Caribbean: Dead Man's Chest, opening July 7, the first of two sequels to a 2003 movie smash that no one saw coming. "It just felt so natural, normal and right, you know?" Depp said yesterday, explaining how easy it was for him to slip back into the role of Capt. Jack Sparrow. "I just walked onto the set, first day of shooting, first scene, and I looked around me and I saw all the same crew members, the same director, all the same faces. It felt to me like we'd had about a week break since the first one." Not everyone would describe dressing up in a pirate outfit as a "natural" thing to do. But it's not far from Depp's normal attire, which consisted of a white T-shirt and jeans, set off by more tattoos, chains, jewelery and geegaws than you'd see in a sideshow freak show. He also sported the grey silk hat that has become his trademark of late. The franchise debut Pirates of the Caribbean: The Curse of the Black Pearl was seen prior to its release three summers ago as a sure sign of Hollywood's creative drift, since it was based on a Disneyland thrill ride, of all things. And the pirate movie genre had long ago been declared buried, with no treasure map to find it. For Depp, the shiver-me-timbers role of Sparrow, pirate at large, was viewed by pundits as a desperate career gambit. Despite winning critical acclaim for his talent and versatility in such diverse films as Edward Scissorhands and Donnie Brasco, he wasn't seen as a bankable star. Nor did he want to be one, as he continued to take movie roles based not on box-office prospects but on how much he liked the script or wanted to work with the director, rather quaint notions in today's blockbuster film economy. Even producer Jerry Bruckheimer, the rainmaker of many a multiplex crowd-pleaser, had few illusions about the chances of a pirate movie in the 21st century. "There were limited expectations for the first Pirates," he admitted. "Lots of people thought we were making a Disney ride movie for toddlers, and what's more, the pirate genre had been dead for 40 years, and every attempt to revive it had bombed miserably." But all this was before the public got a look at the movie, and fell in love with Depp's savvy channeling of the pirate as rock star, modeled none too subtly after Rolling Stones guitarist Keith Richards. Along with the likable Orlando Bloom and Keira Knightley, who provided romantic spark, Depp took Pirates all the way to an Oscar nomination, global box office of $653 million (U.S.) and a slew of pirate-themed products, including a new line of M&M candies made especially for the movie. It's all come full circle. Disney is now remodeling its Pirates of the Caribbean theme park attractions to include characters from the movies. In classic movie serial fashion, Dead Man's Chest picks up where Curse of the Black Pearl ended, with a marriage intended, but trouble intruding. Jack is mistaken by an island of cannibals for a god, until his antics persuade them to the contrary. And in classic sequel fashion, everything is bigger and the story is much more complicated—and considerably darker. The movie was filmed in several Caribbean locales this time, including Grand Bahama Island, where the set miraculously escaped major damage last fall by Hurricane Wilma. There are several villains in Dead Man's Chest, the best of them being Davy Jones, a wrathful spectre with a octopus for a face [Editor's note—squid, not octopus], played by British character actor Bill Nighy. Special effects are much more in evidence this time. A terrifying sea monster called Kraken that can tear a ship apart with its tentacles helps makes this Pirates installment much more frightening than the original. So successful has the Pirates franchise become, Dead Man's Chest is viewed as a possible contender to knock off Titanic as the most popular movie in history, with global box office likely to exceed $1 billion—and the crow's nest is the limit for the final part of the planned trilogy, which has already been filmed and is scheduled for a summer 2007 release. All of which explains the smile on the 43-year-old Depp's face as he met with the press to talk about how it feels to confound all the nay-sayers. He was joined at a press conference by producer Bruckheimer, director Gore Verbinski and co-stars Bloom, Nighy, Stellan Skarsgård and Naomi Harris. 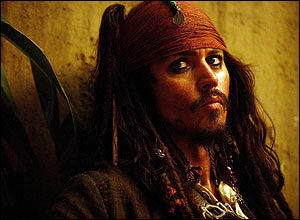 Verbinski said he thinks the role of Sparrow is the closest to Depp's real personality. In most of his other movies, Verbinski said, Depp is "going against the grain" with a character who is at odds with his environment. But in Pirates, Depp seems entirely at home in the world of villains, vamps and voodoo. Depp doesn't quite see it that way. He has a strong affinity for others of his multifarious characters in his two-decade career, citing Ed Wood and Raoul Duke (a.k.a. Hunter S. Thompson) as two others he's fond of. "He's definitely a big part of me," he said of Sparrow, "but they all are." Most actors in Depp's position, having established such a beloved and indelible character in a money-making franchise as Sparrow, would demand maximum screen time. Not so Depp, who was quite happy to see other members of the cast enjoy some attention. It's possible that there's less of Depp onscreen in Dead Man's Chest than there was in The Curse of the Black Pearl. "I don't know that it's being so generous," Depp said. "The writers had a lot to do with it as well. One of the things we talked about when the idea was brought up to do a sequel to the thing was it was very important and we all around agreed that it shouldn't be the Capt. Jack show . . . that really would have been the wrong way to go. "I think if Capt. Jack worked in Pirates 1, he worked not just because of me, but because of those other characters. Because of Orlando, because of Keira, because of Geoffrey (Rush), because of the writers. "So you got to have all those elements to make the thing work." Co-star Bloom said Depp told him during the making of the first Pirates film that he shouldn't listen to what people declare to be success or failure, when it comes to making artistic choices. "He said, `I made a career out of making movies that are considered to be failures,'" repeated Bloom. Depp laughed when told of Bloom's remark. And he agreed with it. He'd rather have fun risking failure than be bored by going for certain success. And yet he's dangerously close to being reliable with this franchise, which is going to do extremely well, no matter what movie critics might say. Depp also had a global hit with last summer's Charlie and the Chocolate Factory. The big question now is, will the lack of failure spoil Johnny Depp? Could success stifle his creativity? Not a chance, if Depp has any say in the matter. "The fact that Pirates did as well as it did and Charlie and the Chocolate Factory did as well as it did is kind of great, but it's not going to make me change my approach to the choices and to the work. "I still do exactly the same thing that I've always done." But being able to pull off a character like Sparrow, and to build a franchise like Pirates still feels great regardless. "You feel like you can tackle anything," Depp said. "There's great safety in playing these people." Besides, he's not taking anything for granted. "I've still got a couple of failures under my belt!"